a new and “improved” food lifestyle seems to pop up every morning. at this rate, vegetarianism will no longer be considered an alternative diet as clean eating, raw diets, veganism, gluten-free diets, paleo, juice fasting, lacto vegetarianism, case-in free diet, locavorism reign high. a whole pool of evidence, both pros and cons, sit behind each of these lifestyles, luring or deterring joiners. as a cook, these fads function as a limiting tool for much of what I like to make: sweets. a cake with no flour? a brownie mix with no egg? a pie with no crust? yes, those are the confines of some of the above-mentioned lifestyles, and while i lean towards a food regimen that consumes anything, i’m willing to dabble in someone else’s food restrictions. i stepped again into the world of gluten-free baking with this recipe, a place where i have failed so many times before. the lack of flour or substitute flours tend to mix up the balance of a typical dessert, creating end products that are too eggy or sugary in many cases. this recipe steers away from flour all together, a canny movie by author Emiko Davies. lacking the traditional crust, this butternut squash pie allows the pie filling to take center stage. 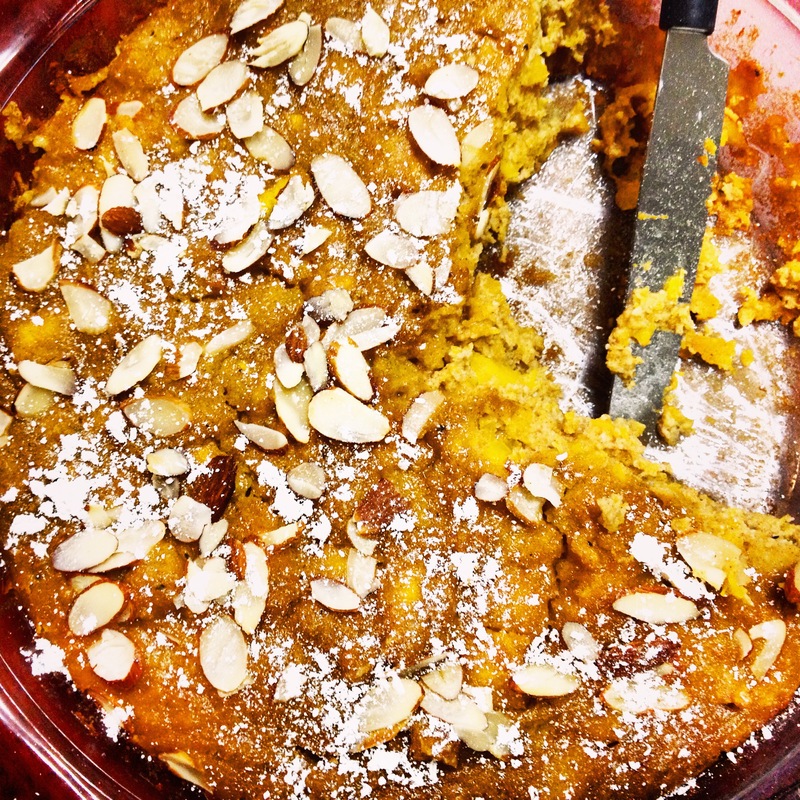 if you’re a fan of pumpkin pie, this butternut squash variety will make you question your allegiances. as cousins in the gourd family, when mixed with butter and cinnamon, pumpkin and butternut squash pie filling become indistinguishable, giving way to torpedo spoons that rake and consume this dessert in minutes. topped with powdered sugar for flavor and crunchy sliced almonds, this pie is a true trophy of gluten-free baking. remove the seeds and skin of the squash and chop into inch-sized cubes. This link offers a great tutorial for how to do that: How to Peel and Cut Butternut Squash. 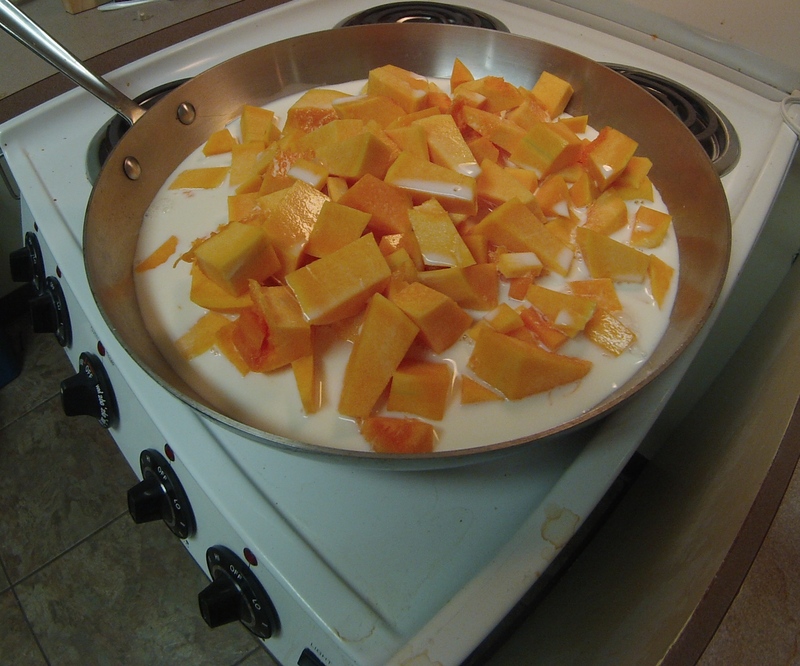 place squash in saucepan with the milk. simmer about 25 to 30 minutes or until soft. drain and leave squash in a colander or sieve to drain and evaporate as much as possible until cool. then transfer to a bowl and mash or purée the squash. i suggest using a food processer if you have one. in a separate bowl, beat eggs together with sugar, butter, almond meal, cinnamon and pinch of salt. Stir through the cooled squash/pumpkin to combine well. pour the mixture into a greased pie dish. sprinkle top with the sliced almonds. bake for 45 minutes or until golden on top and set. when cool, give a healthy dust of powdered sugar and serve. whipped cream is another smart topping.